Pile tart greens and onions on sheep cheese and garlic toast. Run it under the broiler to wilt, then feast. Not very different from French bread pizzas, these invite riffs… add tomato, anchovy, chopped olives. Use sautéed onions instead of the greens. Or skip the greens and instead drizzle the cheese with honey and lightly brown under the broiler. 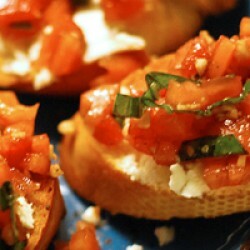 You can have the bruschetta done ahead up to the point of sprinkling the greens with olive oil. Eat them hot, warm or at room temperature. Toast bread in the oven or over a fire. Rub with garlic (for milder garlic flavor, rub it on the bread before toasting) and moisten lightly with the olive oil. Sprinkle each slice with salt and pepper. Arrange on a baking sheet. Preheat boiler, setting oven rack about 6 inches from heat. Blend together onion, salad mix and basil. Cut the cheese into thin slices. Divide the cheese between the slices of bread. Top each bruschetta with several leaves and onion rings. Sprinkle liberally with olive oil, salt and pepper. Run under broiler until greens wilt and cheese is melted. Remove from oven, sprinkle with balsamic and eat hot, warm or at room temperature. Adapted from The Italian Country Table: Home Cooking from Italy’s Farmhouse Kitchens by Lynne Rossetto Kasper (Scribner 1999).